"The blue monotony of sky supplies a calm backdrop for the dramas of life unfolding in the fore. 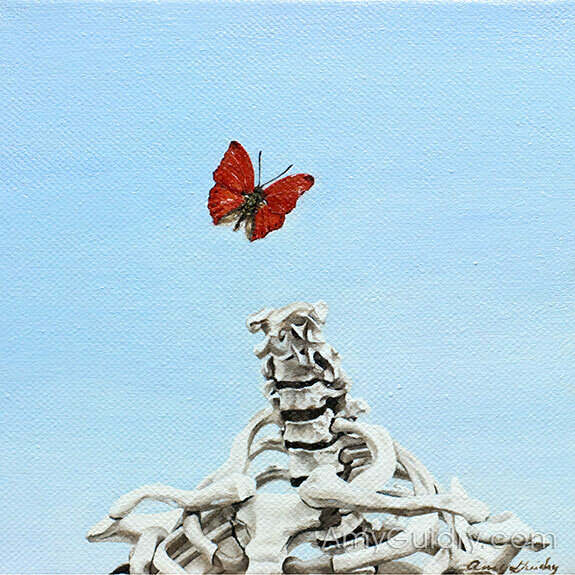 In place of one's brain — one's mind — a vibrant butterfly is suspended, captured as in a photograph. And while the skeleton below it easily invokes the realization of one's own mortality, Fragility moves into the closed arena of immortality: because time itself is essentially frozen in this moment of personal epiphany. The piece, therefore, is more about life than it is about death. The butterfly's wings are fully extended, implicating an almost fearless embrace of emotive experience and emergent intellect. And to do so while recognizing the inevitability of death (a reality that may vanish in future generations) is admirable and particularly courageous."